Heroes' Day in Surabaya. Rawon in Probolinggo. Waking early in the morning, we are greeted outside the hotel by Supri, our guide of all things East Java when we are in the tour van. Supri will provide a thousand laughs and insights over the coming days, his smiles endless, even when teaching us about the grim eras of his nation's history. 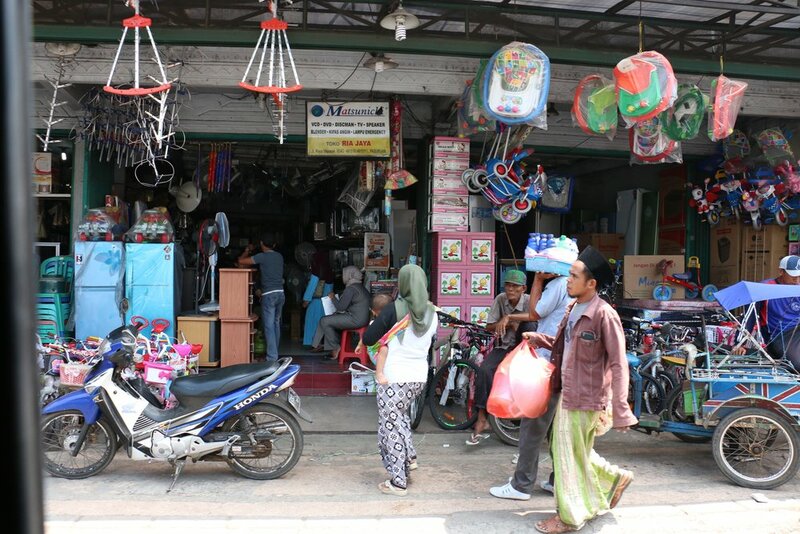 Its November 10th, Veteran's day in America and something similar is happening in Surabaya, the largest city in Jawa Timur. As we roll down the driveway, snare drum hits begin to fill the air, the van stops and we jump out to get a look. Soon hundreds of people approach our way, many wearing camouflage, waving flags, marching down the busy main avenue. Its Heroes’ Day in Surabaya, a day celebrating the turning point in the Indonesia National Revolution; The events toward independence between Indonesia's declaration of independence in 1945 and the Dutch recognition of Indonesia's independence at the end of 1949. For further reading on the history of Indonesian Independence, I've included Hyperlinks to articles within the Bold letters. Rayden Adding Kartini, a profound thinker in pre- independent Indonesia, whose work helped form the National Awakening Movement. "Kartini incorporated feminist principles, community welfare and education in her pursuit of the national Indonesian identity and her quest to modernise her traditional society, advocating changes in gender status and principles of individual and national self-determination to realise the Indonesian universal dream of independence and self governance." She worked tirelessly for the emancipation of Indonesian women and built schools for indigenous girls. Her birthday is now recognized as a national holiday. The path to undo the horrors of colonialism in Indonesia began officially in May 1908, which is commemorated as the National Awakening. This was an anti apartheid movement by indigenous Indonesians to develop a national consciousness that would intellectually unite the many peoples of the archipelago. The Dutch did their best to suppress the Independence movement. They arrested Sukarno in 1929, then banned the Indonesian National Party and several other nationalist organizations. "Although nationalist sentiment remained high in the 1930s, real moves towards independence remained stifled. With the dramatic changes of the Second World War, however, political power was recast forever." The years surrounding World War II were a chaotic sea change for Indonesia. In the Netherlands, the Dutch found themselves occupied by Nazi Germany and could barely put up a fight as their centuries old colonial empire in Indonesia (still called The Dutch East Indies) was toppled by Axis Japan in only 3 months. Japanese occupation was welcomed by some as a better option then European colonialism, but the reality was a brutal era of oppression. After the war, the Japanese negotiate Java back to the Dutch, which is reoccupied with help from Allied Britain, only to be toppled indefinitely, this time by the People’s Revolution of Indonesia. General Mallaby was killed in his car. Nov. 10th, 1945. What is being celebrated in the streets this morning is what is historically considered the turning point in the struggle for Indonesian Independence: "The Battle of Surabaya". This bloody battle took place in 1945 and began with the death of the British commander, Brigadier A. W. S. Mallaby on November 10th. The fight galvanized the independence movement and convinced the Dutch and British governments that a majority of the nation’s people supported the uprising, not a small group of rebels as they had hoped. The British soon claimed neutrality and within 5 years supported the Indonesian Republican cause at the UN. Estimates of actual casualties have never been determined but it is thought to be between 45,000 and 100,000 Indonesians were killed between 1945 and 1949. Also here was our first experience with an authentic bowl Rawon: a beef stew that is served black because the main herbal ingredient is Kluwak, a large seed that is toxic when raw. To make it servable and delicious, the seed is cooked in coconut ash, detoxified, soaked and dried - then ground as a marinade element for the beef. The broth was deep and complex, the “Joss” (charcoal) process actually gives the meat some crisp profile notes on the front of the tongue, letting the flavor develop slowly on the back of the pallet. Highly recommended. Rawon, a delicious and spicy Indonesian black beef soup. The use of charcoal in Javanese cuisine is fascinating. 8 years ago, in Yogyakarta, I experienced "Kopi Joss" on a dare. A Kopi Joss is when burning coconut charcoal ember is dipped into heavily sugared Iced coffee. It was to be the first of many Indonesian coffee drinks that would open my mind to the world of South East Asian coffee. At the shop, we serve a take on that Kopi Joss in the form of our Black Maple Latte, a Cortado whisked with activated coconut charcoal and Vermont maple syrup. From our website: In central Java is a coffee experience one is soon not to forget. Several years ago, a local psychonaut and health guru going by the name "Mr. Pac-Man" begun dipping burning coconut charcoal into Iced Coffees and selling them on the streets of Yogykarta. 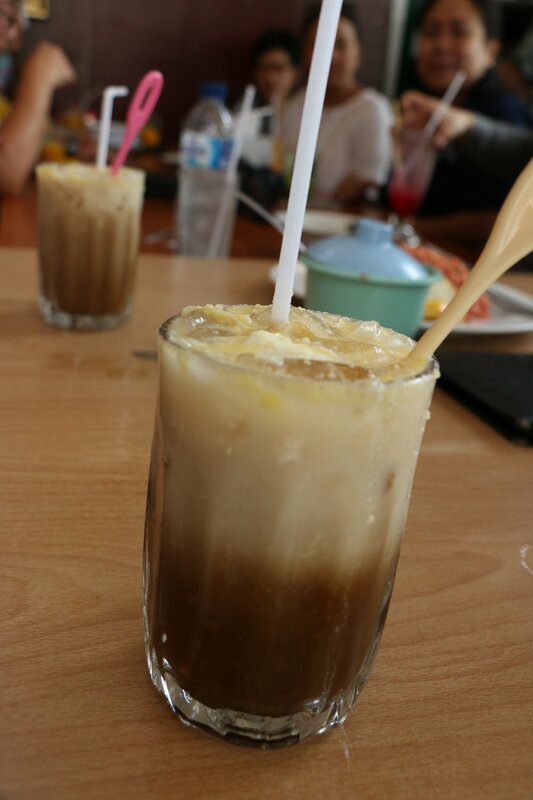 Known as "Kopi Joss" many locals and travelers seek out Mr. Pac Man's brew for its detoxifying effects. We use high grade Activated Coconut Charcoal, widely regarded as a powerful antioxidant, cavity fighter and hangover elixir.